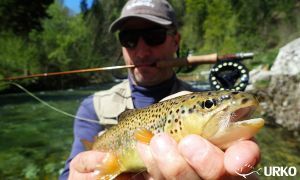 At Urko Fishing Adventures our guides take joy in providing you with an unforgettable fly fishing adventure in Slovenia. 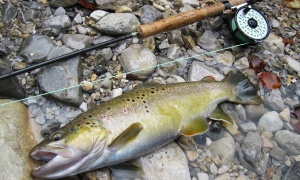 We also organize guided fly fishing tours to our most beautiful and well known rivers across Slovenia, like Soča and Idrijca, with its renowned marble trout, the river Unica which is one of the best grayling rivers in Europe, the karst beauty Krka with its famous cascades made out of travertine, or the cool mountain beauties Radovna, Bohinjka, Savinja and many more. 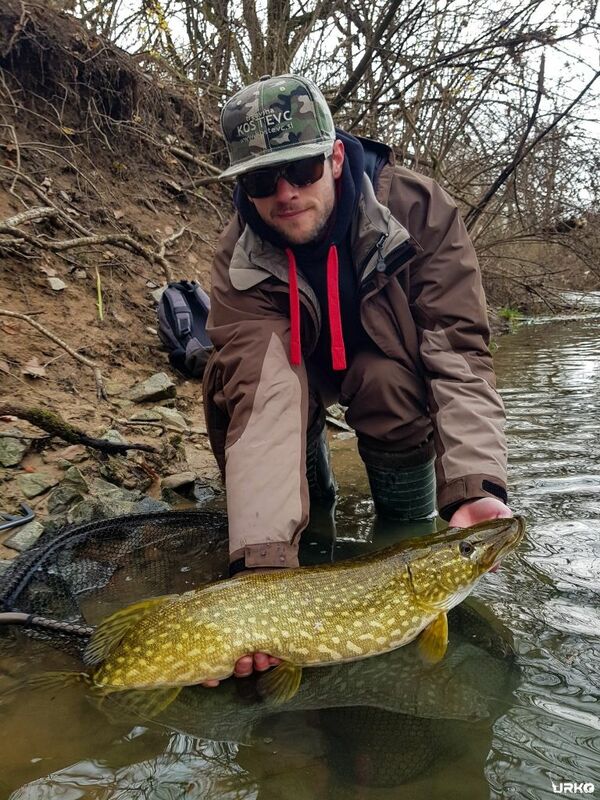 We are certa View more...in, that we can find something for everyone, from the beginner making his first casts, to the most experienced angler. URKO Fishing Adventures can also be reached via WhatsApp by clicking here or by sending a message to +38631681288. 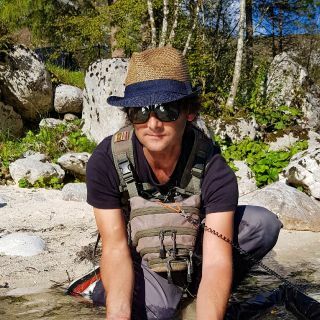 I had an excellent few days of fishing with Uros in May, 2018. 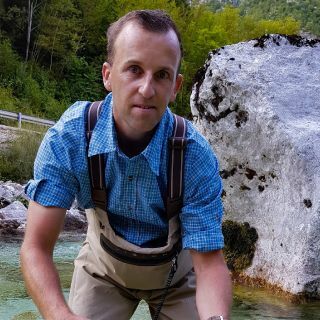 Uros is full of knowledge and love for his home streams, and knows how to find the fish. What a beautiful country, good trout and grayling fishing, and an outstanding overall experience. Hope to see Uros again on the river very soon! I had an incredible week with uros. Fished 6 different rivers each one was totally different from the next.And caught a few different species at each one,his knowledge of the rivers is second to none.I will definitely be fishing with him again in the future.The service he gave me was exceptional,l was collected every morning from my hotel and wanted for nothing.It really was a great adventure looking forward to the next time. I had two day's fishing with Uros that covered 5 different stretches of river on three separate streams. Everything about Uros' services was as good as I have ever experienced. 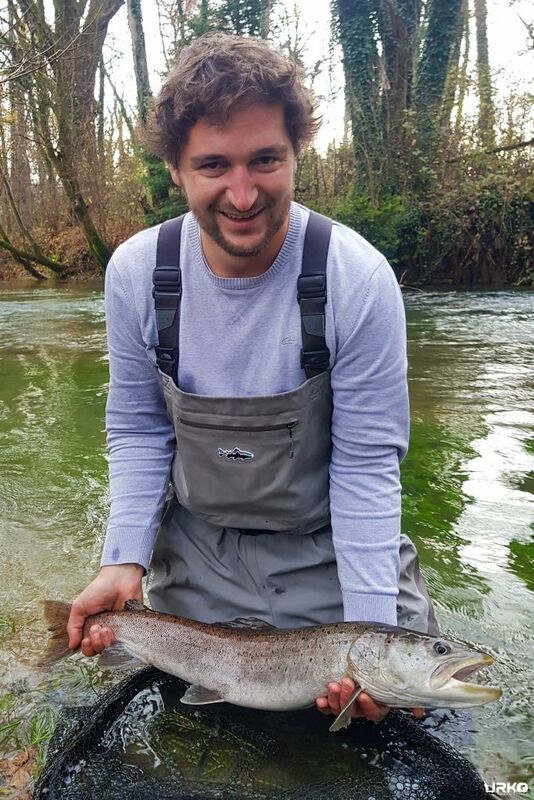 Uros went much further than I expected to make my fishing memorable, and the fishing was better than in my home country, (New Zealand). The first chance I have, I'll be back! 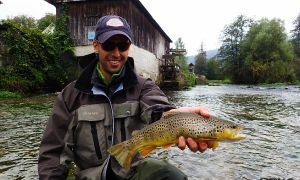 My friend Jonathan and I had a great 4 days fishing with Uros in Slovenia. He gave great advice and took us to prime fishing water away from the crowds. He also is very good company and did more than required to make our fishing trips successful and very enjoyable. Highly recommended. Tom. 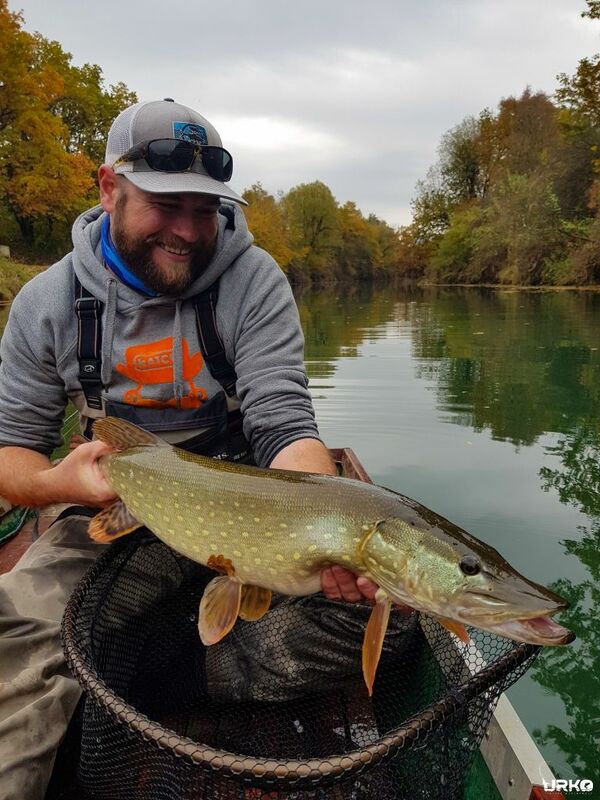 Had a lovely day with Uros fishing the river Krka (upper part). As I'm quite a beginner, i learned a lot from him. 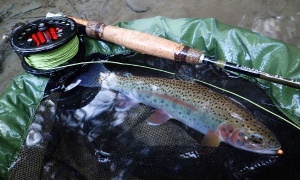 Caught so many nice trout on dry fly although it was earyl April. We all know how this story goes. You meet someone and he says: »I am fisheman«. After few hours you exchange stories, experience and knowledge. Subsequently you become friends. 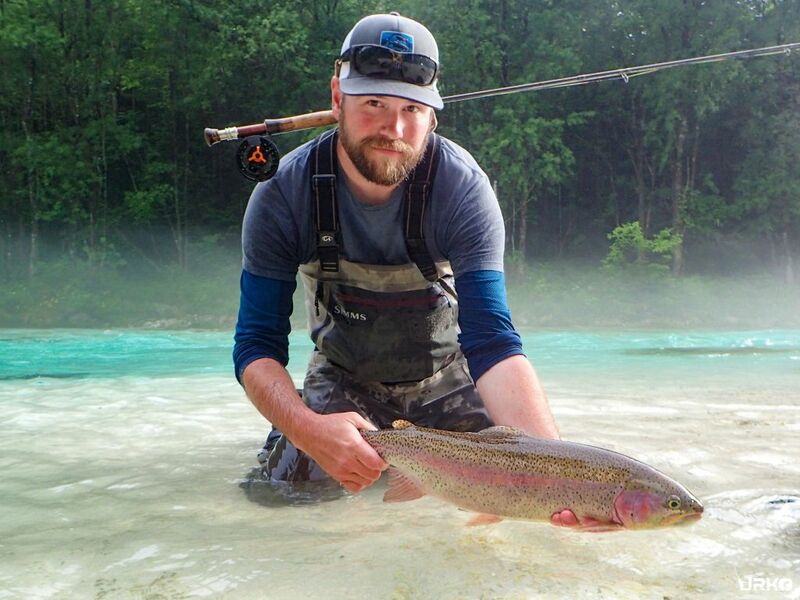 Urko / Uroš has strong knowledge about Huchen/lure fishing and fly fishing. That's something I am lacking in my fishing department. Finally we arrange time with Urko, so he can show me, how to properly fly fish. Regardless my injury on my dominant hand, I made a call "LETS GO", that's something I couldn't miss. 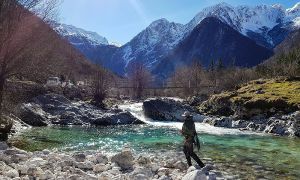 On D-day we went to the river SOČA "upper part" which is managed by Fisheries Research Institute of Slovenia and it was f***ing beautiful. Nice weather, clear river and most important Urko has nice way of explaining "how" and "why". Which I think it's very important by my opinion! In no time I caught my first rainbow trout on a nymph. Then the second one and next one and so on. We were exploring the upstream and downstream the river. 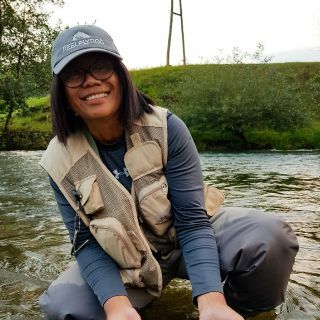 And in no time I learned different casting techniques using dry fly, french nymphing rig and etc... 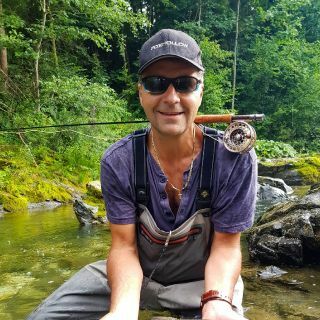 I had so many questions, huge "SHOUT OUT" to Urko, who managed to answer all of them and that he showed me proper ways of fly fishing. His humble opinion was that I could catch +20 fish on that day, but due to lack of my experience, I still managed +10. »Not bad for first time!.« was his response with a big smile. Overall he caught the biggest trout and he landed majority of fish which we caught that day (bragging rights), but he was more happy for me, what "I" have accomplished on that beautiful day. I have fished with Uros on 4 trips over the past two years and everyone have been incredible. He is super friendly, organised and knowledgeable and goes way above any previous experiences I have had with Guides. Nothing is too much trouble and he is great at adapting to your needs whether a novice or a pro. He was really patient and kind when I fished with my wife too rather than my usual buddy. 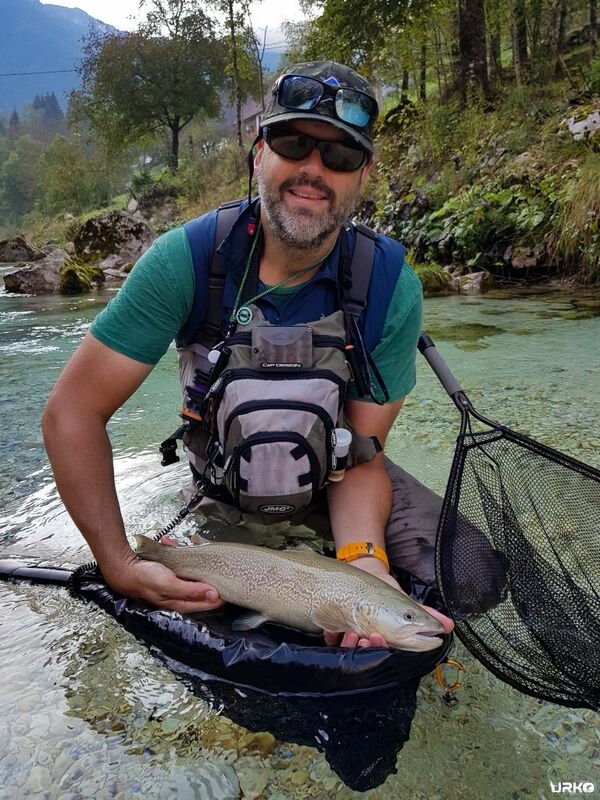 Fly fishing is Slovenia is fantastic - amazing scenery, waters and people. Highly recommended, so much so I am going back again for a 5th trip in May 2018! Had the pleasure of 2 days on 2 Slovenian rivers (won’t name them, but you can figure it out) guided by the extraordinary Uros Kristan, in July, 2017. 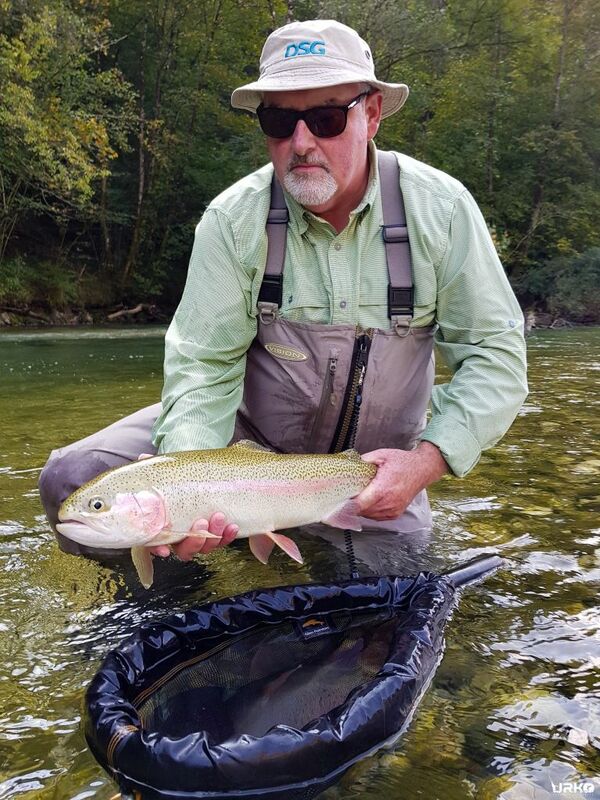 The first river, a striking, impossibly blue trout stream, yielded rainbows from “proper” to “OMFG!”. Fished this with my adult daughter, who had been out a couple of times and got the hang of it rather quickly, and her boyfriend, who had not and did not. Uros, at my request, put in a lot of time with these novices, yet never let me far out of his sight. 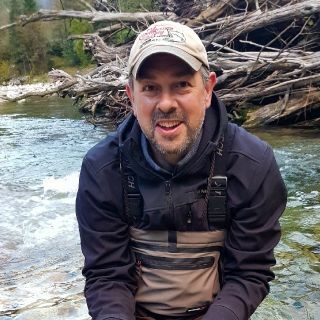 As we’d hoped, he was able to put them both onto nice trout, and who knows, maybe my wife won’t have to leave my fly rods to a rummage sale when I die. The second river, up the road from a famous Lake, flowed through a bucolic countryside that could have been the Ozarks, overhanging willows and old mills, medieval villages with laundry on lines, and a healthy population of native browns. Uros patiently coached me as I flicked bow and arrow casts to one big hen feeding almost inaccessibly under the shelter of stream side bushes, lessons I’ve since put to use in the States. 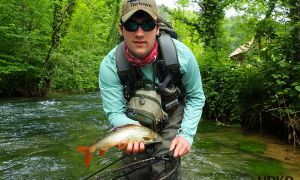 He’s the ideal guide - he respects the habitat and the resource, he teaches generously and tolerantly, and he loves to fish. He knows the individual rivers at a granular level - and man, there are plenty more I’d like to try. Additionally, his pre-trip advice on accommodations and tourist destinations were all spot on, and his explanations of history and current affairs really informed our experience of his beautiful country (did I describe sufficiently how beautiful this place is?). All of us look forward to getting back there again soon. 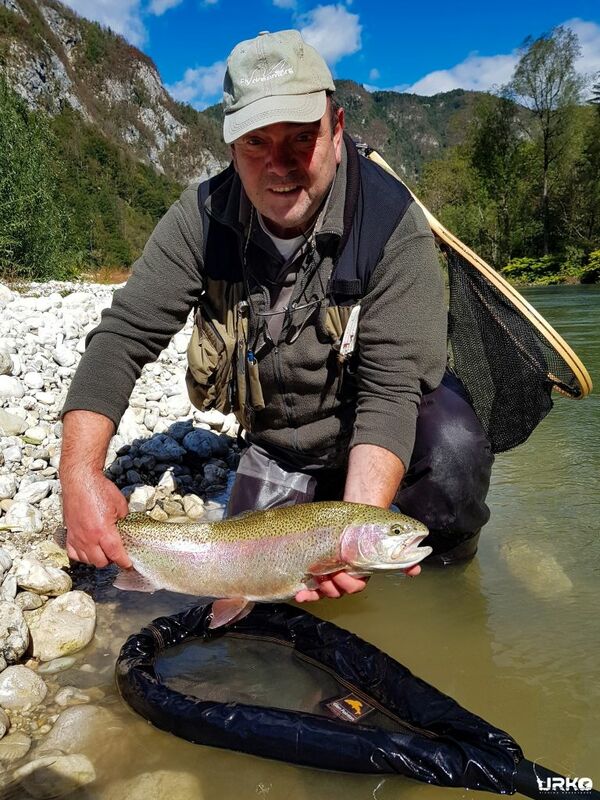 I have had a fantastic day fishing Sava Bohinjka with Uros in the late Oktober this year. This was my first time fishing with Uros and I absolutely enjoyed every minute of it. He is just a great guy to hang out with anyway, let alone doing so in such a fantastic environment. 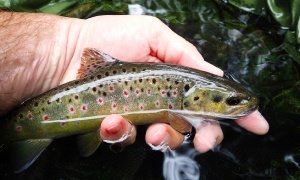 I caught few brown trout, many rainbows and some really nice graylings. 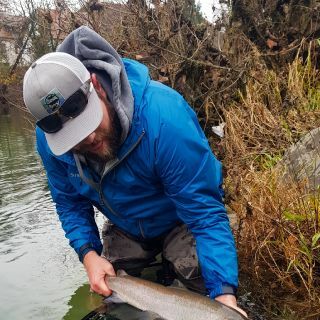 I have definitely walked away better and more environmentally and fish friendly angler with lots of tips and little secrets that he shared selflessly. 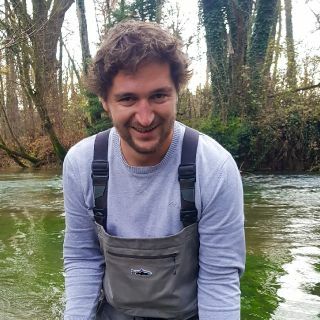 Uros possesses all the qualities that good guide would ideally have… he is a great companion, genuinely passionate about his country, its rivers and fish welfare. He is so committed to provide service to his customers that is second to none. 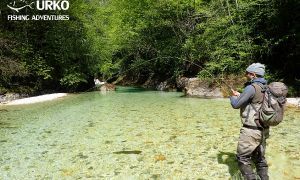 I saw on the web by chance the fly fishing portal "Flydreamers" and there I came across the presentation of Urko Fishing Adventures. I contacted Uros and within a few days the trip was easy and uncomplicated booked. I fished in early September four days with Uros and I must say this was one of my best trips I have ever done. A wonderful landscape, beautiful rivers and I think I have never seen so many big brook and rainbow trout and also grayling as in those days. 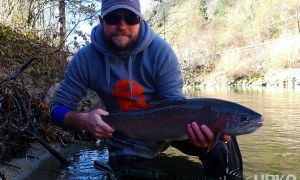 Uros knows all the rivers very well and it was a great pleasure to fish with him. 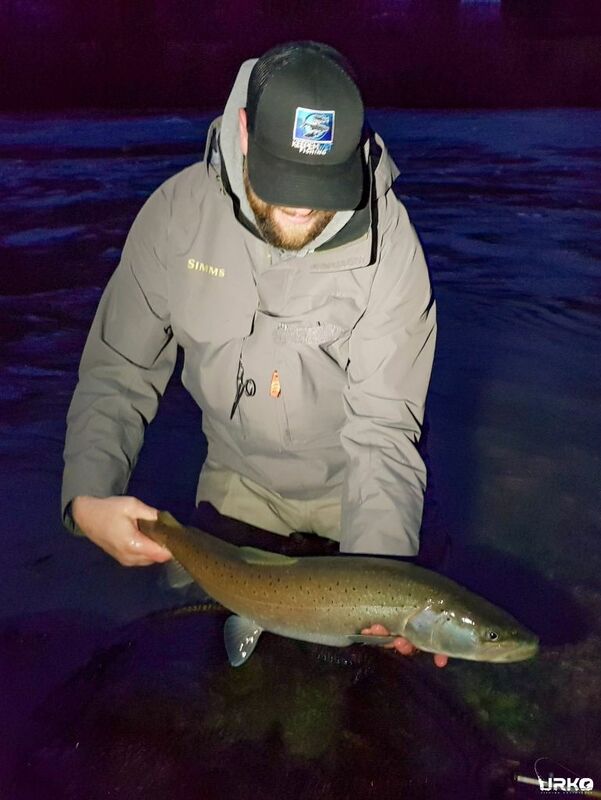 Despite the late season, my catches were excellent, but without Uros this would certainly not have been the case. Therefore, my highest recommendation for Urko Fishing Adventures! See you soon again, Uros! 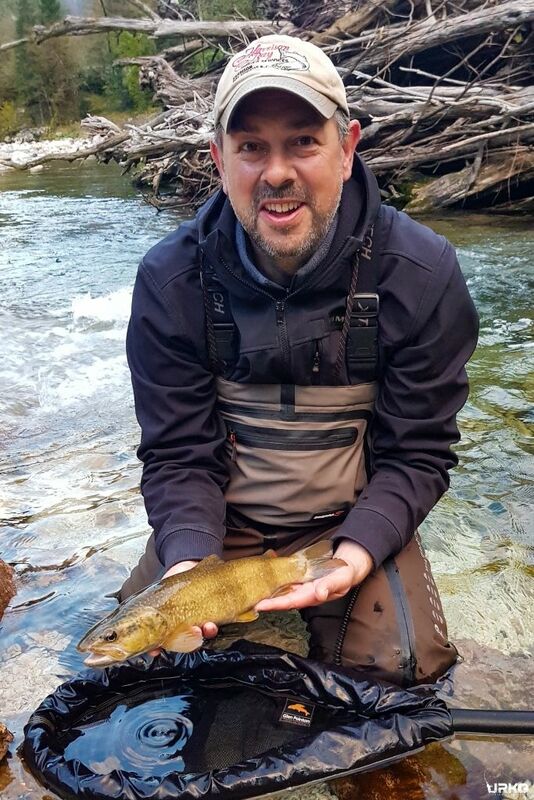 I fished with Uros on the Lapena and Soca rivers on the 25th July 2017. 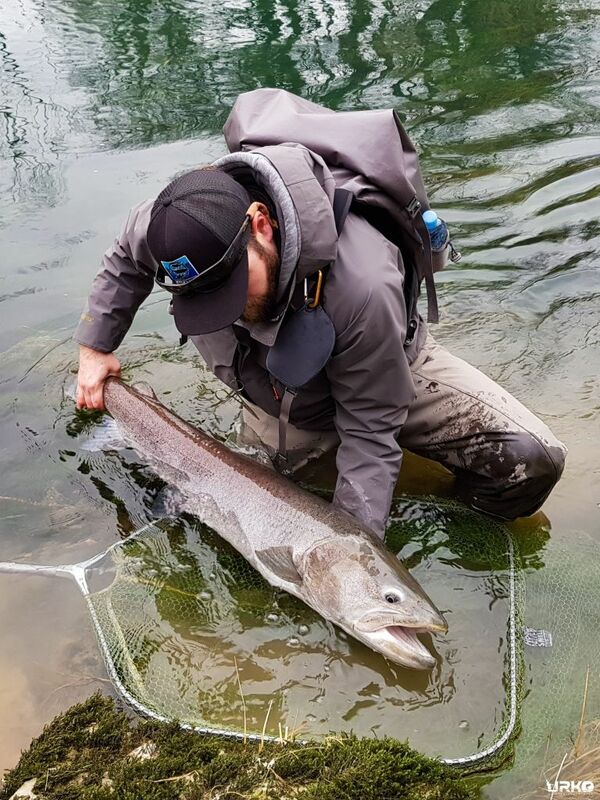 We had a fantastic day, catching plenty of fish across both rivers. It was a fantastic opportunity to learn sight nymphing, and Uros taught with great clarity and patience. I can’t recommend the services of Uros and his brother Matej highly enough. Their watercraft, knowledge, patience, humour, passion and instruction is simply first class. 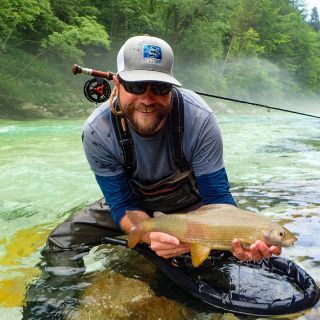 Slovenia offers such a vast array of fly fishing opportunities and these guys grew up on the rivers and know them inside out. 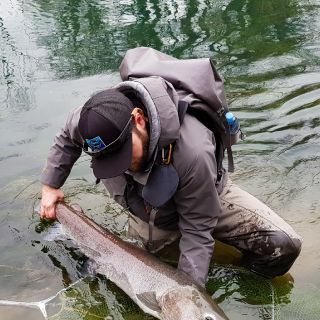 I’ve had a few guides before and the best ones make you feel like you’re their first ever guests, as if you’re special, even when your fly snags the same branch for the second time. 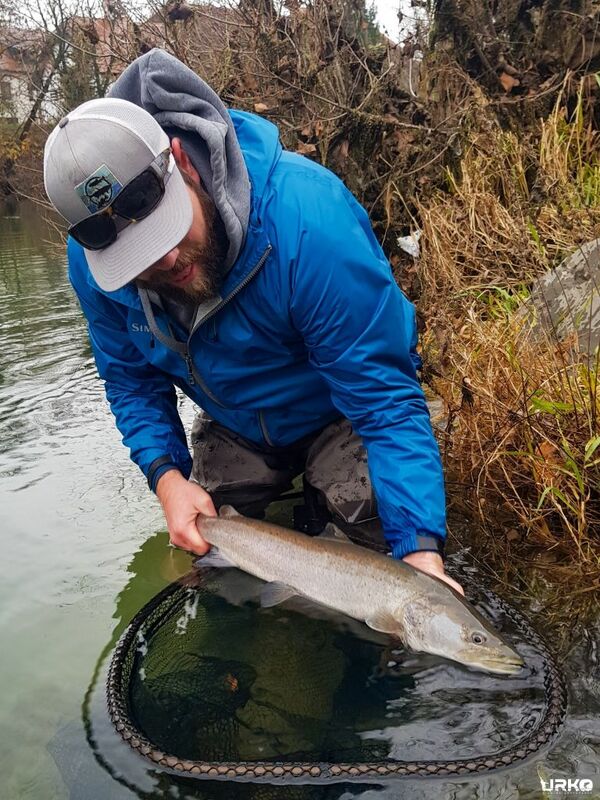 They are proud of their amazing rivers, and rightly so, making great efforts to ensure the waters we fish today can be as good for those who fish them tomorrow. Our first day was on the wonderful Unica, a chalkstream that disappears into caves and reappears seven times until it flows into the capital city. It’s amazing to have so many grayling rising to dry flies, to look down at the bottom of the river your feet are disturbing to see huge grayling inches away from you in the crystal clear water. 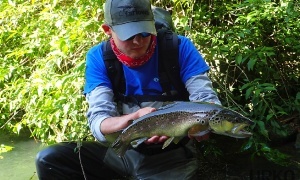 We were lucky enough to have a small evening mayfly hatch and catch some brownies too. We drove over some mountains to fish the Savinja for our second day. 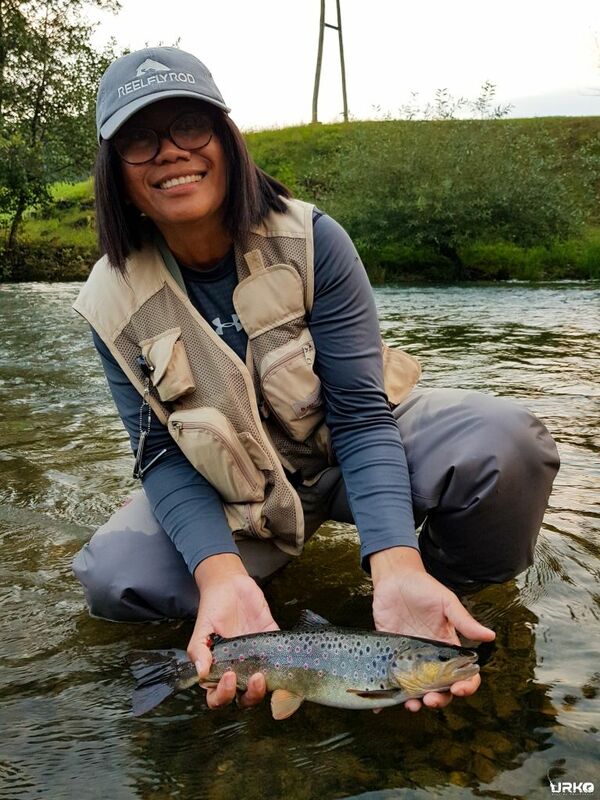 The morning was spent on the lower stretches catching trophy trout – quite an experience playing hard fighting 5lb+ rainbows in a strong current on light tippets! 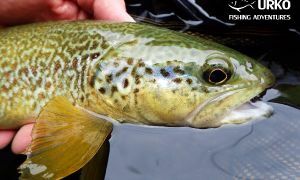 The afternoon we headed upstream to some idyllic beats with plenty of smaller fish eager to rise to the dry fly, the sorts of places you only imagine in your dreams with overhanging rocks and fishy shapes moving slowly in the turquoise waters slurping flies. On our final day we drove over the snow-capped Julian Alps and ventured into Marble Trout territory. 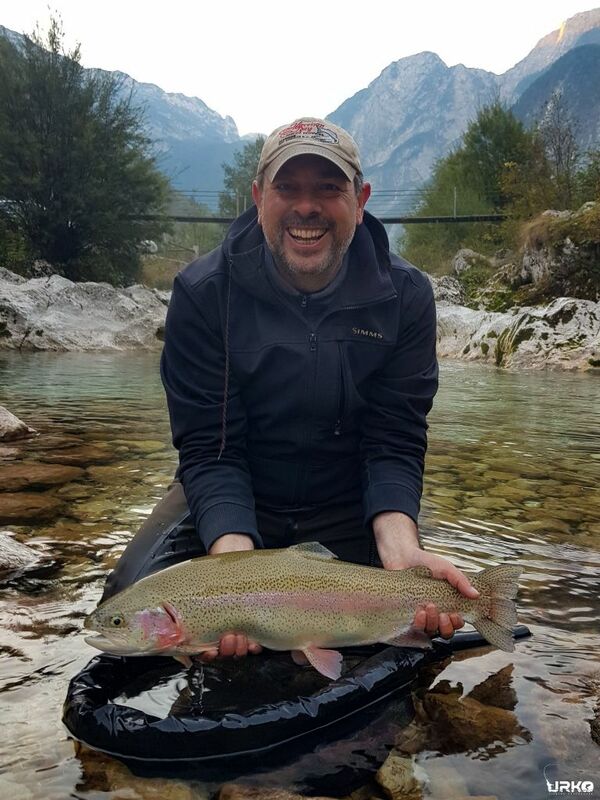 The Soča was in full flow so we fished a tributary called the Lepena. 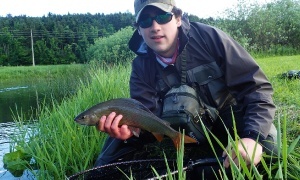 Within minutes we had landed a lovely Marble on the dry fly and lost one on a nymph just before it made the net. The views here are breath taking, and the fishing is even better. Especially when aided by a steady flow of cold beers from the guide’s tardis-like backpack. We lost count of the fish we caught and the many different styles we fished, high sticking, bow and arrow, upstream dry, downstream dry. Every bend we came to presented a different opportunity. And there are fish everywhere. 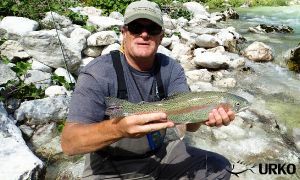 Just before we had to head to the airport we spent an hour fishing the edges of the Soča where it was possible to get a fly fishing without being swept away by the current and sure enough were rewarded with another Marble and some fine rainbows. 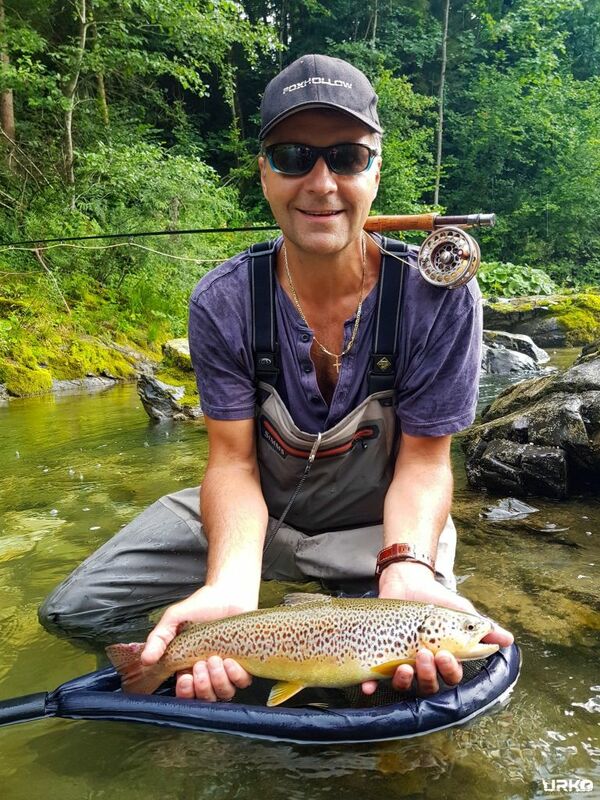 Fly fishing in Slovenia is very special. I think we barely scratched the surface of what it offers. While I often day dream stuck at my desk about being a guide and having an office like Uros does every week, I have neither the skill nor the patience. Nor do I think I could relish my guests catching fish as if I was hooking them myself. 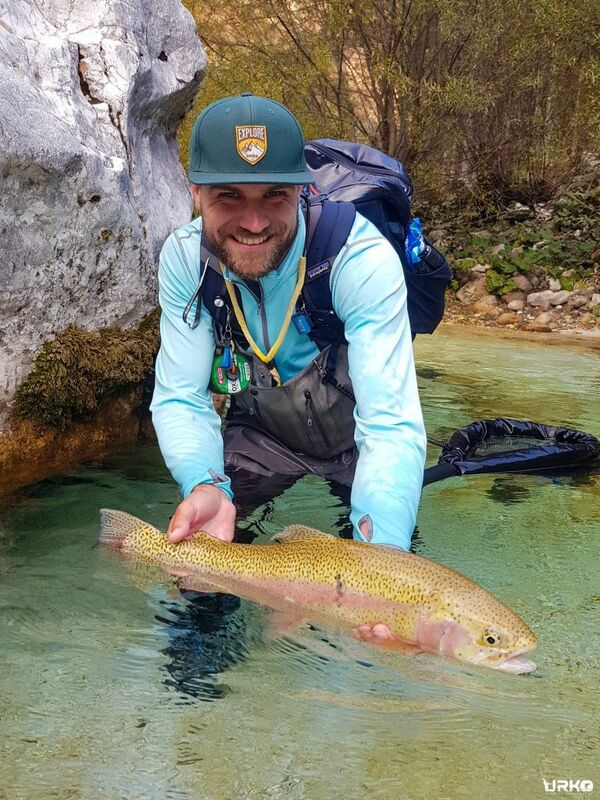 Another reason why if you’re coming to fish Slovenia, you should make sure you have one or both brothers guiding you. This was our group’s first fishing adventure abroad, and we’ll be back. As soon as we can. Thank you Uros and Matej for making our fishing such fun and ensuring we left with such amazing memories. Simon, Tim, Chris & Seb, England. I had the pleasure of fishing with Uros mid March this year. 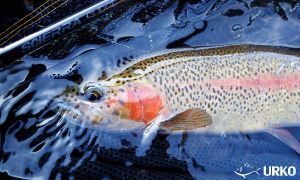 First and foremost, he was transparent with me that it was early in the season and not all options were available yet (species or rivers). His outfit caters to one's specific needs / desires. He realized that I liked to fish hard and even asked me if I was willing to skip lunch, which I took him up on. Uros picked me up at the airport, took care of the driving, permits, and made it a relaxing trip. His knowledge of the rivers, his friendliness with locals, and his laser vision are his best qualities. Uros taught me how to French nymph and we ended up alternating fishing pools traditionally vs French style nymphing. 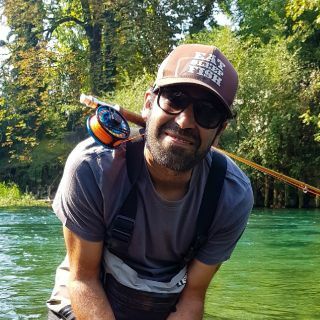 Uros' view of nature, his passion to put you on fish, his patience, and his sense of humor made it a blast. I could not have asked for a better companion, guide or friend regardless of the time of year (we took fish on dry flies in mid March). 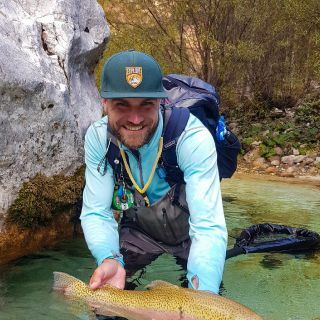 Slovenia is a unique, beautiful place and in the end - the guy is fishy! 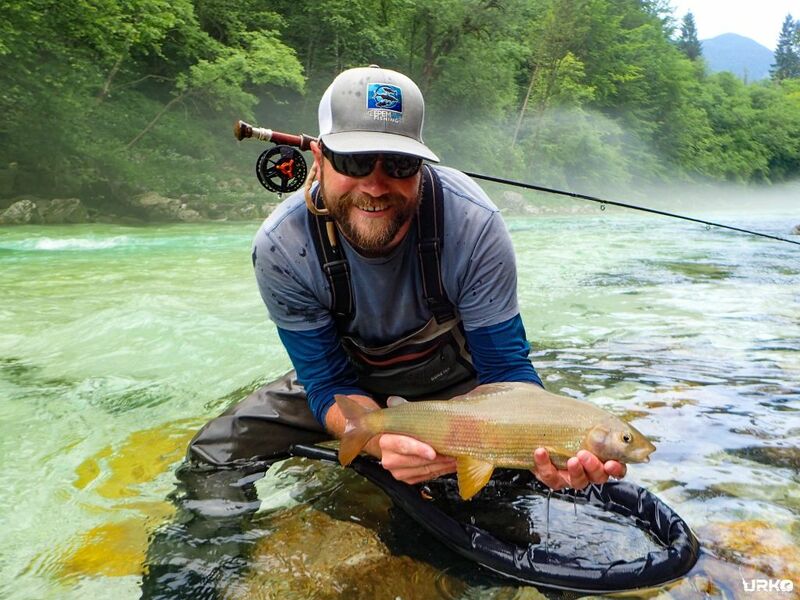 I fished with Uros on river Soca two weeks ago and I'm still buzzing of excitement. The whole experience was above my expectation! 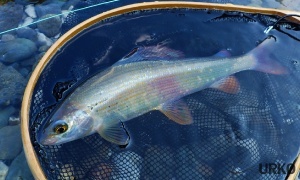 Breathtaking views, crystal clear water, 8 beautiful rainbows in my net and of course Uros who made it all possible. Since the first contact with him by email I was very impressed with his professionalism and thoughtfulness. 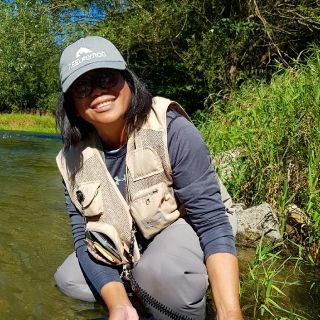 I'm still new to Fly fishing and had lots of questions and worries as a beginner. Uros was always prompt replying my numerous emails and made me trust him before going on water. moments of tranquil interaction with water. I will definitely come back to explore Slovenian waters with Uros. A friend my little son of 8 and me fished with Uros for two days during June. It was an excellent experience, since Uros is a very friendly and professional person. 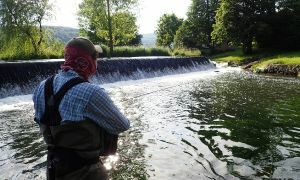 We always felt taken care of and were shown great spots in the rivers we fished. despite many fishermen being on the river we never saw them, which I reckon to be quite an achievement. Uros always instructed us about the options we had for fishing, what we were to expect at the rivers and if that matched our expectations and skills. I am sure I can speak for my travel companions too, when I am saying Uros is a super guide, very enjoyable to be around and great companion on and off the river. Next year again!!!! 1) Uros has explained pros/cons of each of the rivers before we went fishing so that we could make a decision on where to go. And his description was spot-on. I think this is a very important quality in a good guide. 2) Uros is great company and I very much enjoyed our conversations during the weekend. He kept all members of our group busy and engaged for the whole time! All in all a really great experience that I can highly recommend. 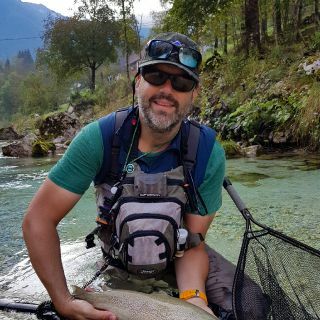 A fishing buddy & I had heard about Urko Fishing Adventures and its proprietor, Uros Kristan, through another fishing friend and I was immediately intrigued whether it really could be as good fishing as he suggested? So we decided to give it a try and duly booked flights to Slovenia at the start of June 2016. We were greeted at the airport by Uros and straightaway felt at ease. After a short drive to the hotel to drop our bags off we set off for the evening rise and the magical crystal clear rivers of Slovenia. We fished hard for 3 days on 5 different rivers and had an absolute blast catching a good number of fit, healthy, hard fighting fish. 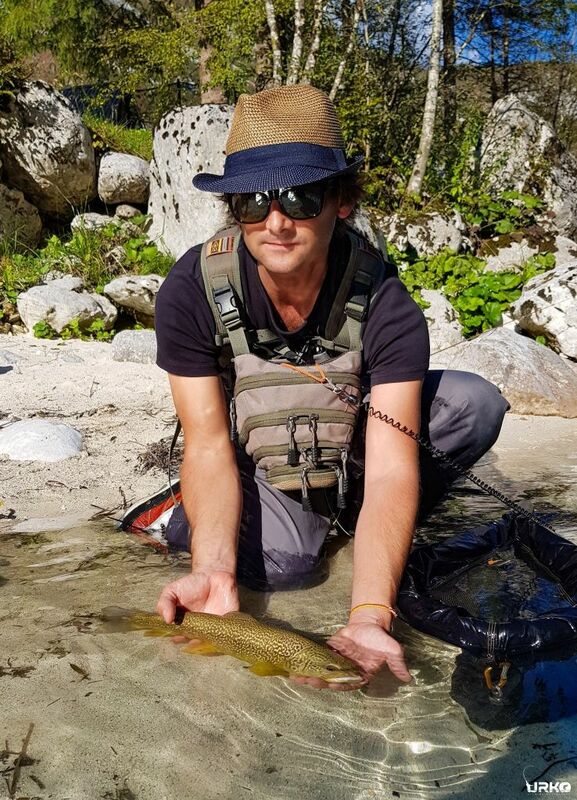 Uros' guiding skills are superb, with an unnatural skill to spot fish at a glance as well as a great knowledge of the history of Slovenia. Nothing was too much trouble whether it was rescuing a snagged fly in a bush or arranging for a restaurant to stay open in the evening so we could make the most of an explosive evening rise. 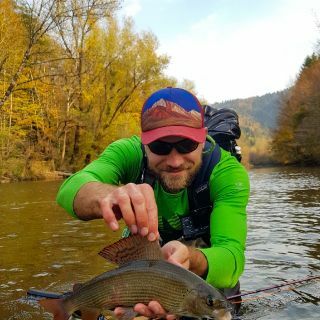 We caught mostly Grayling which we both love to catch - in fact my personal best Grayling was caught in Slovenia on the pretty little river Bistra - a good 45cm beauty, sight fished on a dry fly; the ultimate test of skills. 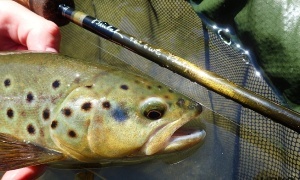 But with skill and a bit of luck you could easily be hooked up with 30" Brown Trout, Chub or 60" Danube Salmon. 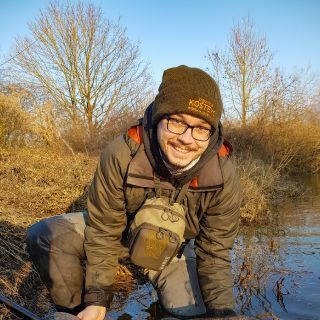 We had no issue with Uros fishing along side us on occasion, and we witnessed him land a 7lb Chub from the smallest of channels using a French Leader technique. Awesome fish! We dined well in a good mixture of local restaurants and slept happy in the lovely Bistra Guesthouse hotel - all organised perfectly by Uros. So after all this, would I recommend it? 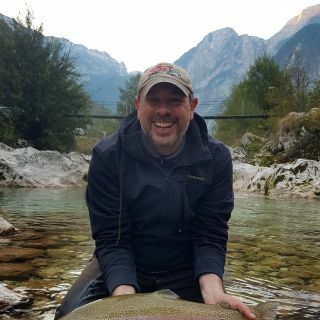 Well, put it this way, I have just booked a 4 day return visit as soon as I got back to the UK in September this year to chase big Marble Trout on alpine rivers. I am looking a flights for Spring 2017 too. 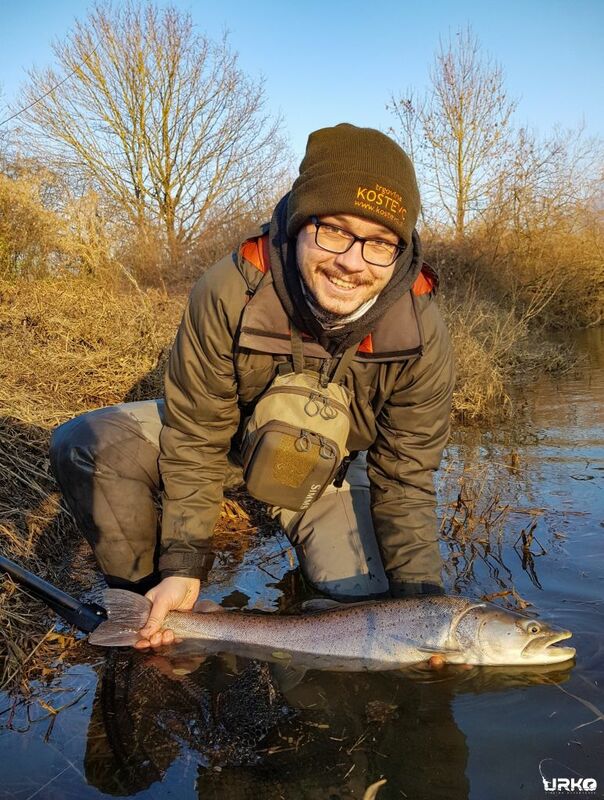 So, if you like to fish in crystal gin clear rivers in unspoilt countryside for healthy hard fighting fish without it costing an arm and a leg, give Uros a shout and let him make your fishy dreams come true! Seriously, it really is THAT good! 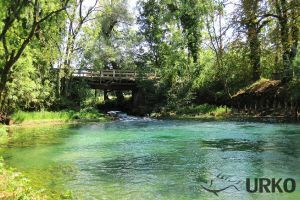 On 28 May I had the luck and pleasure to go back to "my" Isonzo, right where its springs are, in Slovenia, and its local name is Soča. The additional privilege I had was to be guided by Uroš Kristan. 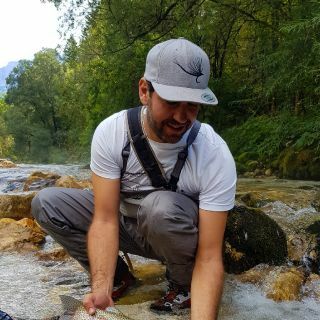 He took me to discover the beauties of the Lepena and the Koritnica, two early tributaries to the Soča, which have peculiar characteristics and hide unique treasures. 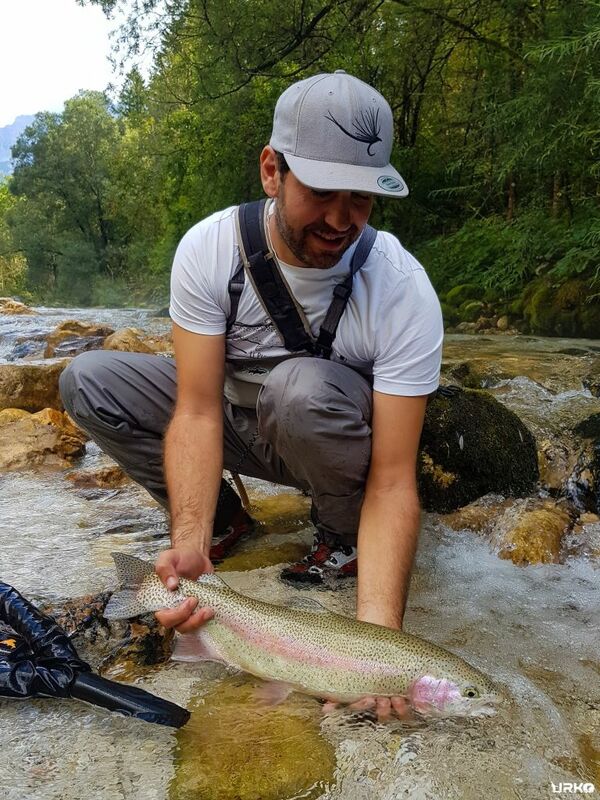 I enjoyed every second of that day, from the early morning sight of stonefly hatches seducing numerous marble and rainbow trouts, to a young deer, quietly crossing the Lepena only 20m away from us, to the unique landscapes that the Slovenian nature offered us. Uroš does have an inch-by-inch knowledge of each of these fantastic streams and it was just amazing to realise how his predictions of invisible trouts being present in certain spots were precisely correct - I did have a great surprise when a good sized marble appeared out of nowhere, right where he suggested me to cast! The day went by so fast, and so pleasantly, that we agreed to meet again, very soon, for 2 new adventures, as soon as I am back in the area: the first one shall be Soča, the first river I fished, as a child, and the 2nd should be Unica. I can't wait for that! I am expecting another extraordinary memory, because that is what you get with Uroš - competence, patience, love for Nature and all the presents it brings to us - all in all, fulfilling fun! Dear Francesco ... Thank you so much for such a nice review ... I'm already excited to meet you again for our new adventure. Tight lines my friend! This was an absolute dream trip. 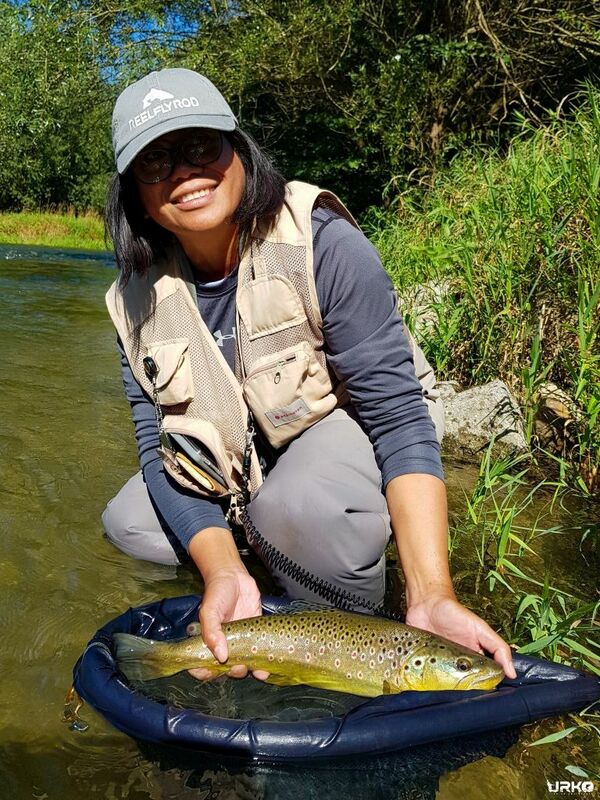 In Slovenia's stunning landscapes we had a fantastic variety of challenges from alpine streams to dry fly. Uros and Marco were extremely enthusiastic, professional, focused on our every need and understanding when we were slow to learn new techniques. Hard to think of how to improve it so we will just have to come back. Dear Christian ... Thank you for nice review! It was really a pleasure to guide all four of you, hope we will soon meet again! 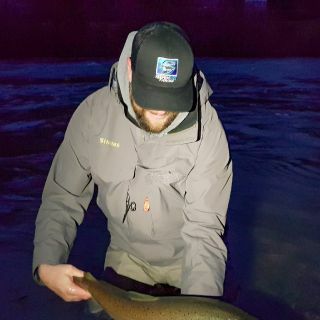 Tight lines from UFA team! I spent a long weekend in Slovenia in mid April 2016. I was aware it was early in the season so wasn't expecting loads of fish. True to form we had some tough days (mid May is the time apparently) but I cannot fault Uros as a guide. 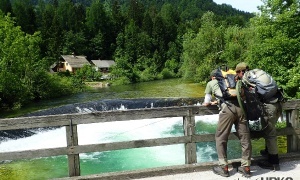 He is incredibly knowledgeable about fly fishing in Slovenia and the country in general. The drives to the rivers were an education in themselves! He consistently put me in amongst fish. He was open, great company and had so many useful tips that i have taken into my fishing in general. 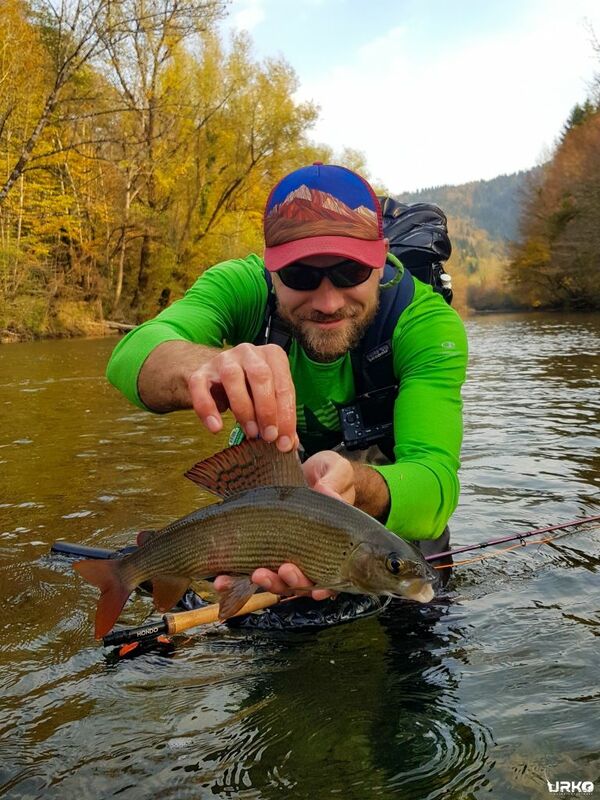 The day i returned i went on my local river in the UK - used some of the methods Uros had showed me - and finally landed a 2lbs Grayling. 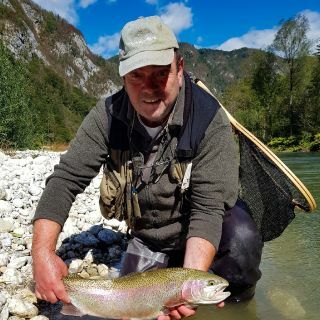 I would say fishing in Slovenia is a must for anyone who loves fly fishing. And Uros is a great person to show you where and how. Hi Duff ... You were one of the coolest clientes to guide ... It was my pleasure to meet you! By the way, Huchen is already waiting for you! Tight lines mate! 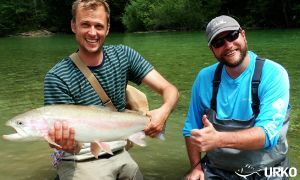 Professional guiding for fly fisherman, guides know what they are doing, and how to work with guests on the best rivers in Europa. 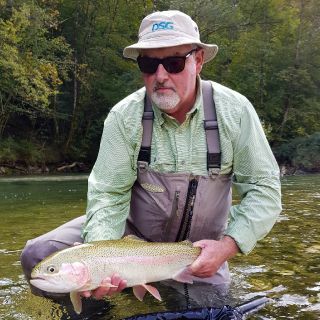 A man with great passion for the rivers, fish and flyfishing, that is transmitable with ease to all going on a fishing trip with him. It was hard to leave Slovenia behind when flying back home. 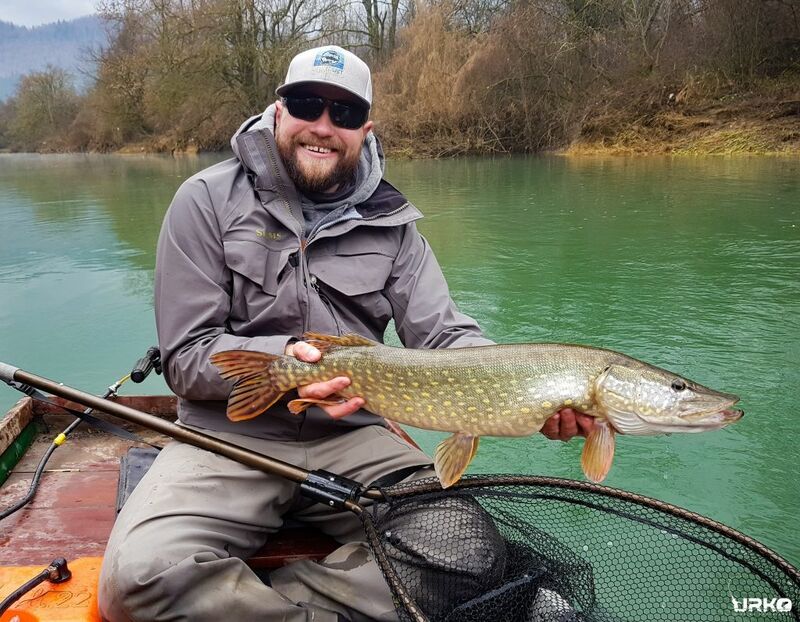 Slovenia is a "must visit" place, with an unique scenario, crowded with monster fish (seeing is easy, fooling them is another thing) and pleasant people. 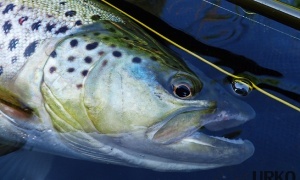 It is really impressive the assortment of different fish and fishing you may have. Uros was able to show me all that in three days. He became "symbiotic" with the environment and has hawk eyes for spotting fish. This great companion is really gonna put you in to fish! One advice: Three days isn't enough! Hi Victor ... Thanks for the review. I hope you will be soon around our region again so, we can meet again. Tight lines! 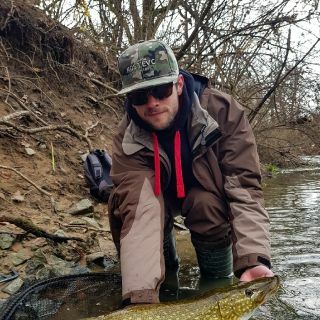 When I decided for pike on fly, I already knew I have to take a guide that will know the water and pikes. 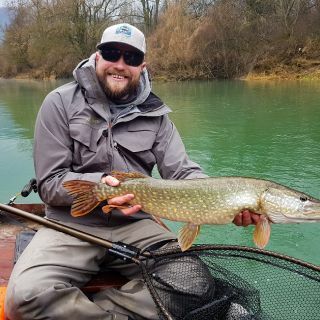 I've been following UrkoFishingAdventures from start and based on the reviews and their team being true soul-fishermen and legends of Slovenian fishing, I had no doubt about who to call for pikes of Ljubljanica. Uros arranged everything and Marko was my guide on Ljubljanica, where Fishing club Vrhnika manages an incredibly rich and "jungle" like part of this river. 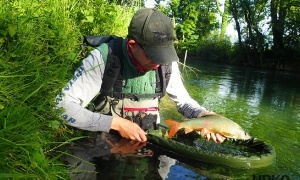 Marko explained to me everything about the behaviours of pike and best approaches to cast to them, manoeuvre the fly etc. Before I arrived he gave me tips on the equipment and fly patterns. And he kept me posted on water conditions 3 days before, he was really pumping my motivation:) I really enjoyed Marko's company, he truly knows his "home". Highly recommended for pike fishing. And he loves fishing danube salmon even more, so he gotta be even more knowledgeable with that fish. Urko Fishing Adventures deliver what you search and want! 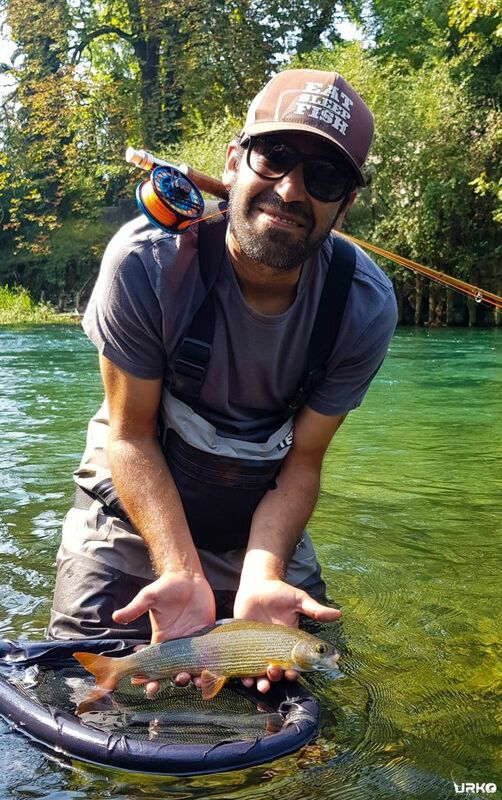 Fishing from a very young age seems to have left some permanent "damage" on Uroš, as I personally do not know anyone that can spot a fish better or faster than him. 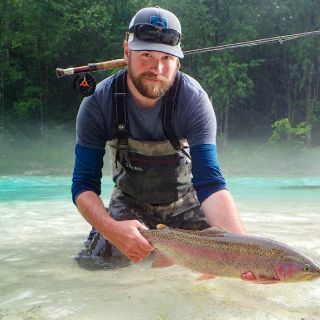 His passion for fly fishing is contagious (I myself am proof of that), his self tied flies are always effective and his positive attitude coupled with his chatty personality make any dealing with him most enjoyable. I as his brother can guarantee you that If you choose him as your guide, he will most surly not disappoint! 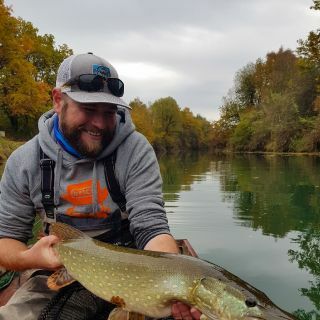 A friend and I hired Uros as our guide on the Unica river in Slovenia. 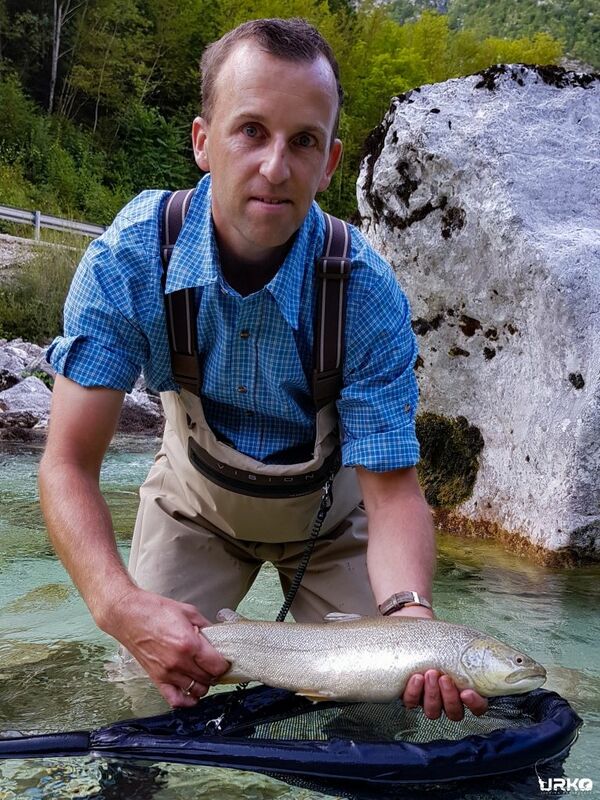 Uros is exceptionally knowledgeable, very patient and can spot a fish from a mile away! 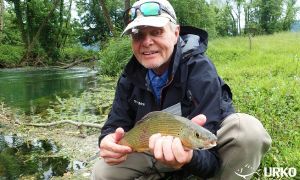 We caught large grayling, browns and rainbows from three different rivers in a single day, what more could you ask for?! his fly box was invaluable, his own tied flies are designed specifically for these areas and situations and caught most of our fish that day. huge thanks to uros - highly recommended! Andy ... Thank you for your kind words!